Cybersecurity threats are an unfortunate reality for industry everywhere. How do you protect your business while still embracing new technologies that enable you to grow and deliver the best possible results? Robust cybersecurity protection is a must, as well as rigorous mindset, policies, and methodologies. 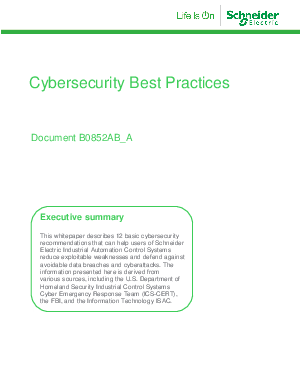 Learn 12 basic cybersecurity recommendations that can help users of Industrial Automation Control Systems reduce exploitable weaknesses and defend against avoidable data breaches and cyberattacks. Download the whitepaper to learn more.